Polish artist Magdalena Abakanowicz is one of the most important artists to come out of Poland during the post-World War II period. The artist was nine when the war broke out, and as a nurse’s aide, she witnessed violence both against her own family and her fellow countrymen, leaving the artist with a sense of tragedy triggered by the overwhelming historical forces around her. Abakanowicz studied art when Socialist Realism was the only approved style, forcing her to seek a visual vocabulary that addressed her contemporary world without censorship. She turned to inexpensive and easily accessible fabrics and soft materials, making figurative works of fiber and burlap, the rough, tactile surfaces suggesting physical or psychological scarring earned through life. The artists’ well-known multi-figure installations of sitting and standing figures recall ancient Egyptian statues that were the earthly representations of Kings and the aristocracy. Yet the works also evoke the shell that remains after these earthly rulers pass into the afterlife. 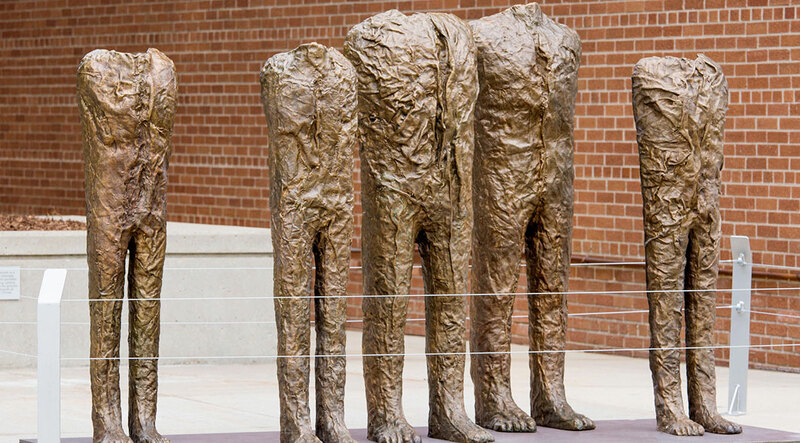 Abakanowicz’s headless figures suggest that the status of leader is but fleeting, all humans end up in the same state of death and decay. Abakaownicz’s bodies also point to the loss of individuality in the crowd, the evolution from unique human to mob, a transformation that has renewed meaning in our contemporary polarized world. Abakanowicz was commissioned to do a site-specific piece by the Women’s Club of Wisconsin in celebration of 125 years of volunteer service in the community. Birds of Knowledge of Good and Evil, 2001, is located at the corner of Kilbourn Avenue and Cass street, and shows the artist’s work in metal. The birds face east, towards Lake Michigan, facing each day’s challenges anew as the sun rises. This work brings a sense of subtle optimism to our understanding of Abakanowicz’s work, rooted as it is in the traumas of human destruction. Abakanowicz was born in Falenty, Poland, in 1930, and passed away in 2017. She attended the Academy of Fine Arts, Warsaw, from 1950-54, and taught at the Academy of Fine Arts, Poznan, Poland, from 1965-1990, influencing several generations of artists. Recent one-person shows have been held in museums and galleries in Canada, France, Germany, Hungary, Italy, Japan, Monaco, The Netherlands, Norway, Poland, Spain, Switzerland, Turkey, the United Kingdom and the United States. She has presented public works in Belgium, Canada, France, Germany, Italy, Luxembourg, Poland, South Korea and the United States. Her work is in the public collections of: The Art Gallery of Western Australia, Perth; the American Craft Museum, the Metropolitan Museum of Art and the Museum of Modern Art, New York; the Stedelijk Museum, Amsterdam; Storm King Art Center, Mountainville, New York; the Centre Georges Pompidou, Paris; the Des Moines Art Center; the Detroit Institute of Arts; the Fond Regional d’Art Contemporain Rhone-Alpes, Lyon, France; the Hamburger Kunsthalle, Hamburg, Germany; the Hiroshima City Museum of Contemporary Art, Japan; the Israel Museum, Jerusalem; the Jardin des Tuileries, Paris; the Kunstindustrimuseet, Oslo; the Muzeum Narodowe, Warsaw; the Nationalmuseum, Stockholm; and the Walker Art Center Minneapolis, among others.